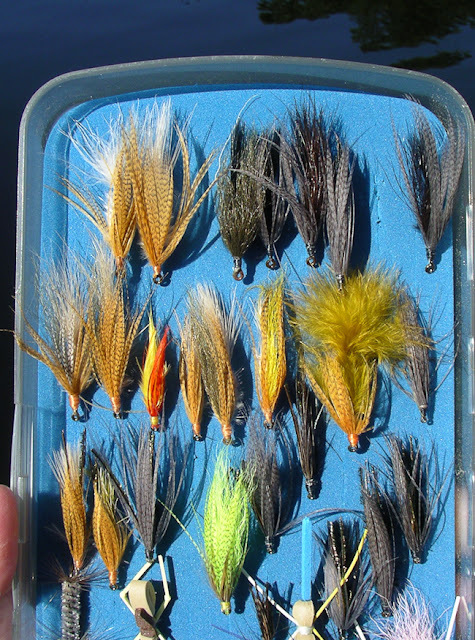 Fishing With Flies :: Blog: A bit of panfishing this week: the "Marabou and Mallard Streamer"
A bit of panfishing this week: the "Marabou and Mallard Streamer"
I have a lot of summer fun fishing for panfish in a local farm pond from a float tube. 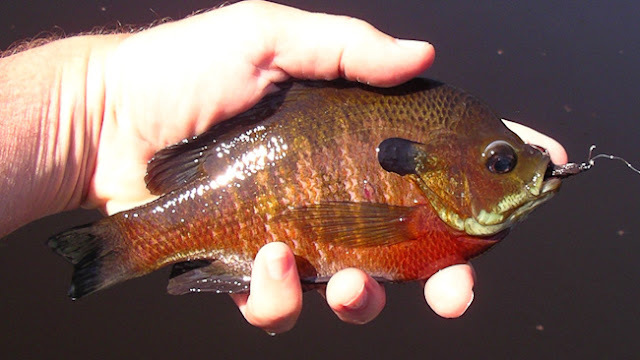 Only a few people have a permit to fish it, and I seem to be the only fly fisher. Occasionally, I will see mini-bass boats with electric motors (these are the boats that you can put in the back of a pickup truck or on the roof of a car), but the fishermen driving these boats are usually fishing baitcasting and spinning gear. Nothing wrong with that. They pull out some wonderfully big bass from the weed beds. And the pond is catch and release. But fishing for big bass in the weeds is difficult with a fly rod. Even if I were fishing an 8- or 9-weight rod, its pretty hard to get the leverage needed to pull bass basically straight up out of the weeds, when I am sitting at water level in a float tube. 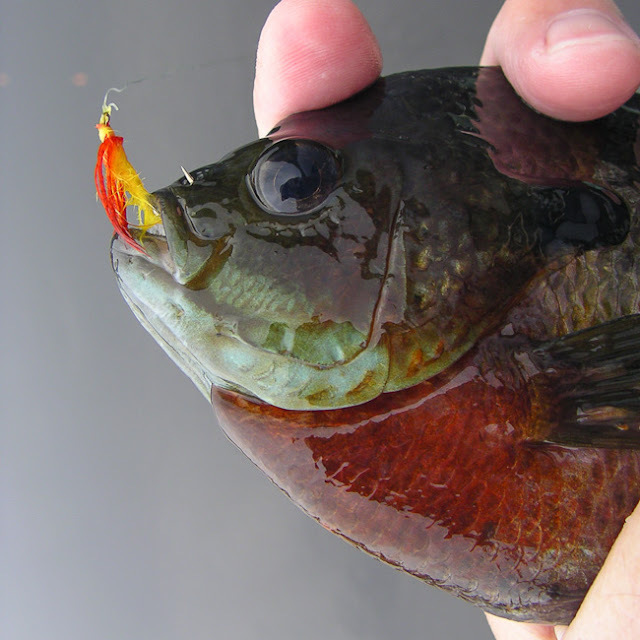 My approach is to fish lighter tackle and aim for the panfish (mostly bluegills) and smaller bass that hang out at the edges of the weed beds. I cast toward the weeds that surround the edges of the pond, and I kick my way around the circumfrance of the pond in a counterclockwise direction. (Is this because I am right handed?) When I get a hit, a bit of initial leverage with the rod will generally keep the fish from escaping into the cover and entanglement of the weeds. Of course, any kind of float tube will do the trick. I've been using a Hobie Float Cat for years. For this kind of fishing I like a 9 foot 5-weight. Unless the fish are particularly finicky, I'll use 2 feet of 3X tippet. If I need to drop a nymph deep, I'll use tippet as thin as 5X and keep my fingers crossed. When using my float tube I use an old Cortland 333 5-weight line, in white. It is not as slick and stiff as newer lines, so it falls on the apron of my float tube in small coils. 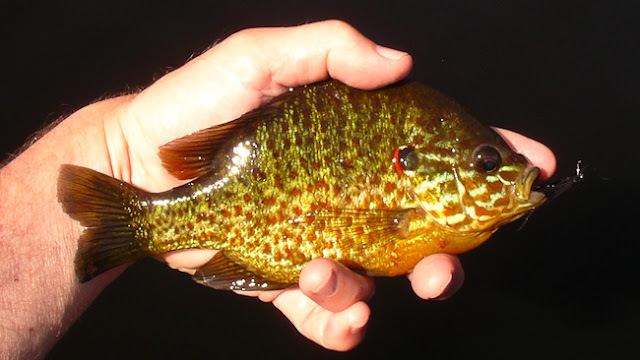 Theoretically I guess your casting distance is diminshed with a floppy flexible line, but when fishing for panfish in a float tube, distance is not an issue. 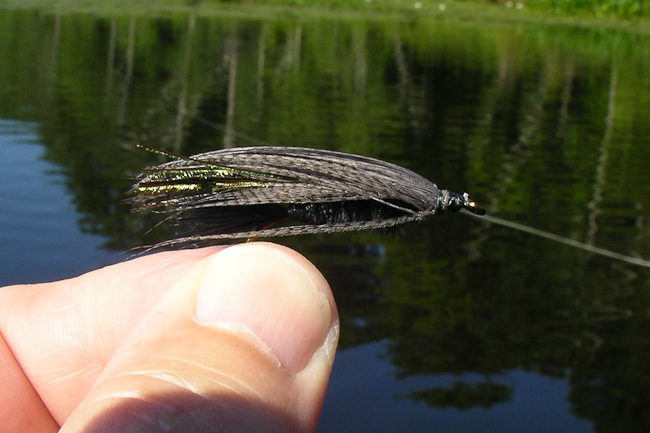 Fly used and how to tie it: the "Marabou and Mallard Streamer"
Last week I had great success with some small weighted streamers, which you can see in a couple of the pictures below. The underbody is 8 wraps of thin lead wire. The body is tied with a single marabou feather. Simply tie it in by the tip, to create a tail about half the length of the hook shaft, then twist the rest of the feather into a rope, then wrap the rope up the shaft as if you were tying a woolly bugger body with chenille. The last step is to use a mallard feather to create a soft hackle collar. 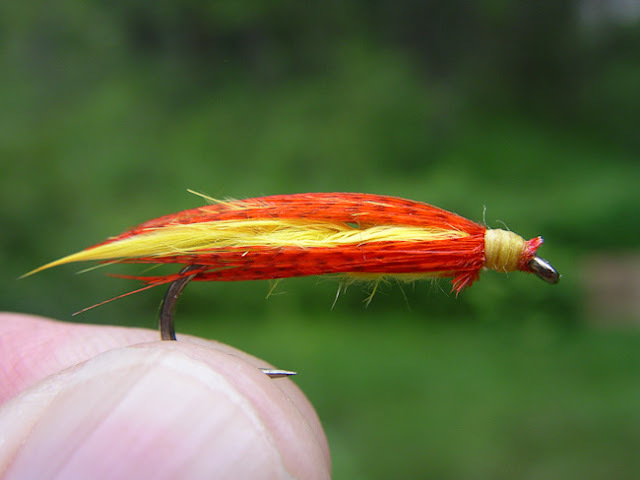 I tie it in by the tip and wrap a few turns around the hook to create a soft hackle collar. I typically snip the hackles off the bottom. This is what makes it look like a streamer and not a soft hackle wet fly. 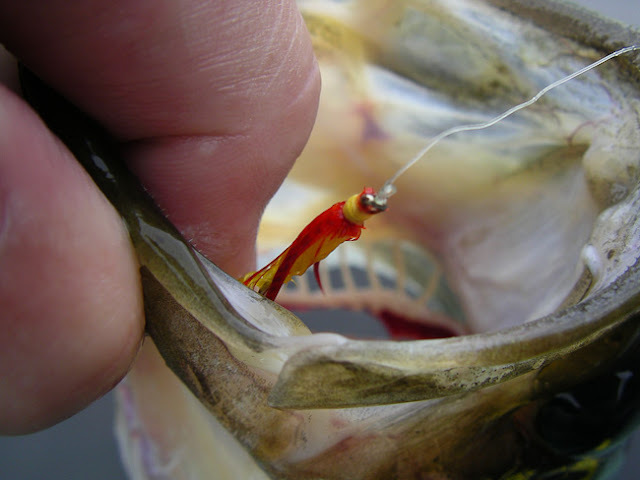 This approach also helps the fly ride in the water with the hook tip down, rather than spinning. This black version was used for the sunfish above. I dressed it up a bit from the original recipe with 4 pieces of peacock herl, as an underbody. Tail and body are made from one black marabou feather. "Wing" or collar is made from dun dyed mallard. I keep a few of these flies in my "Bugger Box". I like having both dark and light colors. Yellow marabou feather for tail and body. My experience is that the bass usually prefer black. Not this time. If there are any pickeral around, they'll go for the bright colors. How small do bugs get?